431 Beacon is located on the south side of Beacon, between Gloucester and Hereford, with 429 Beacon to the east and 12 Hereford (433 Beacon) to the west. 431 Beacon was built ca. 1869, one of eight contiguous houses (419-421-423-425-427-429-431-433 Beacon). The houses were designed as four matching symmetrical pairs (419-421 Beacon, 423-425 Beacon, and 427-429 Beacon, and 431-433 Beacon). 433 Beacon was remodeled in about 1897 and the entrance moved to 12 Hereford. The land on which 419-433 Beacon were built was purchased from the Boston Water Power Company on February 20, 1863, by banker and broker Robert Marion Pratt. He was unmarried and lived at 13 Louisburg Square with his parents, George Williams Pratt (one of the founders of the Boston Stock Exchange) and Mary Barrow (White) Pratt. The Pratts also maintained a home, Oakley, on Belmont Avenue in Watertown (it became the Oakley Country Club in 1898). Click here for an index to the deeds for 431 Beacon. On October 1, 1868, Robert Pratt sold the land on which 419-425 Beacon would be built to George M. Gibson, and the land on which 427-429 Beacon would be built to Caroline (Carrie) Beal (Burgess) Sawyer, the wife of attorney Frederic William Sawyer. 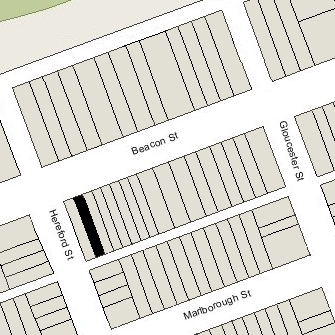 He retained the lot at the southeast corner of Beacon and Hereford and the one to the east of it until after the houses were built at 431-433 Beacon. On December 1, 1869, 431 Beacon was purchased from Robert Pratt by Lemuel Shaw, trustee for Caroline Davenport (Hayward) Savage, wife of Samuel Hay Savage, a shipping merchant and real estate investor. Samuel and Caroline Savage made 431 Beacon their home. They previously had lived at 9 West Cedar. In June of 1874, the Savage family traveled to Europe, and 431 Beacon became the temporary home of real estate developer William Henry Harrison Newman, his wife Sarah E. (Cole) Newman, and his mother-in-law, Bethia (Snow) Cole, the widow of William Cole. They previously had lived at 41 Union Park. 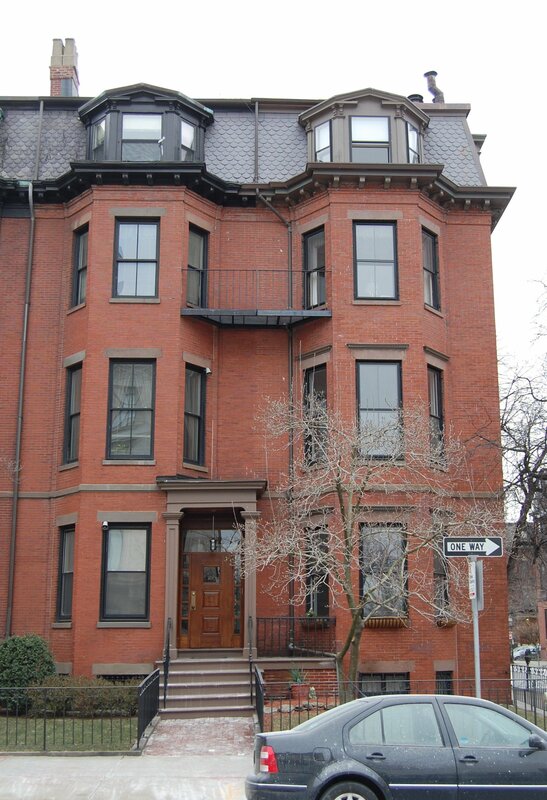 The Savages returned to Boston in November of 1876, and resumed living at 431 Beacon. The Newmans moved to 321 Marlborough. The Savages continued to live at 431 Beacon during the 1886-1887 season, after which they moved to 521 Beacon. On October 14, 1887, 431 Beacon was acquired from John O. Shaw, Jr., successor trustee for Caroline Savage, by Mary E. (Chafee) Gregerson, the wife of George William Gregerson. They previously had lived at 37 Waverly. He was a marine insurance broker and underwriter. Mary Gregerson died in June of 1904. After her death, George Gregerson was joined at 431 Beacon by Miss Elisabeth Lawrence Getzendanner. George Gregerson continued to live at 431 Beacon until his death in May of 1908. Elizabeth Getzendanner married in June of 1908 to William G. McKnight of New York City. The house was not listed in the 1909 Blue Book. On April 9, 1909, 431 Beacon was purchased from the estate of Mary Gregerson by Katharine Smith (Atkinson) Rice, the wife of attorney John Clark Rice. They previously had lived in an apartment at 224 Marlborough. The Rices continued to live at 431 Beacon in 1913. By 1914, they were living in Dedham. During the 1913-1914 winter season, 431 Beacon was the home of Miss Edyth Deacon. She previously had lived at 256 Beacon. Edyth Deacon had been engaged to marry banker George Lee Peabody, who died in February of 1911. She was the sister of Gladys Deacon, who later would become the Duchess of Marlborough, second wife of the Ninth Duke of Marlborough, Charles Richard John Spencer Churchill (first cousin of Winston Churchill), and of Dorothy Deacon, who later would become Princess Radziwell, wife of Prince Radziwell of Poland, and then Countess Palffy, wife of Count Francis Palffy of Hungary. Edyth Deacon had moved from 431 Beacon by the 1914-1915 season. In November of 1916, she married to attorney Henry Gunther Gray; after their marriage, they lived in New York City. 431 Beacon was not listed in the 1915 Blue Book. By the 1915-1916 winter season, 431 Beacon was the home of Dr. Edward Allen Pease and his wife, Margaret Caldwell (Mohler) Pease. They previously had lived in Europe, having returned in October of 1914. They also maintained a home in Westbrook, Connecticut. Edward Pease was a physician and he also maintained his medical offices at 431 Beacon. On July 7, 1916, 431 Beacon was acquired from Katharine Rice by real estate dealer Thomas E. Rothwell. He continued to lease the house to Edward and Margaret Pease, who lived there until about 1918. The house was not listed in the 1919 and 1920 Blue Books. When he acquired 431 Beacon, Thomas Rothwell assumed John and Katharine Rice’s mortgage from the Provident Institution for Savings, and on July 9, 1919, the bank foreclosed on the mortgage. On March 16, 1920, John Rice re-acquired the property from the bank. By the 1920-1921 winter season, 431 Beacon was the home of John Clark Rice’s mother, Cora Lee (Clark) Rice, the widow of John Hamilton Rice. She previously had lived at 13 West Cedar. She continued to live at 431 Beacon until her death in September of 1925. 431 Beacon was not listed in the 1926 Blue Book. In 1926, it was the home of Susan (Jackson) Williams, the widow of real estate trustee Ralph Blake Williams. She previously had lived at 376 Marlborough. By the 1926-1927 winter season, she had moved to 320 Marlborough. 431 Beacon was not listed in the 1927 Blue Book. On June 30, 1927, 431 Beacon was acquired from John Rice by Mary (Walsh) Altmiller, widow of mining executive Charles H. Altmiller. Her sister, Miss Katharine Lawrence Walsh, lived with her. Charles and Mary Altmiller had lived in Brookline at the time of his death in April of 1925. On June 11, 1957, Mary Altmiller transferred 431 Beacon to herself and Miss Elizabeth Ward Loughran, a teacher who had retired the previous year as head of the department of foreign languages at Roxbury Memorial High School. Mary Altmiller continued to live at 431 Beacon until her death in March of 1959. On November 17, 1959, 431 Beacon was purchased from Elizabeth Loughran by Dr. Edward J. Baldi and his wife, Phyllis C. Baldi. In December of 1959, he applied for (and subsequently received) permission to convert the property from a single-family dwelling into three apartments and one doctor’s office. They continued to live at 431 Beacon until about 1963, when they moved to 39 Commonwealth. On September 27, 1963, 431 Beacon was acquired from Edward and Phyllis Baldi by Dr. Joseph Peter Thornton. J. Peter Thornton died in March of 1974. At the time of his death, he and his wife, Therese (McCormack) Thornton, lived in North Andover. On March 16, 1976, 431 Beacon was acquired from the J. Peter Thornton Trust by Francis J. Gill, trustee of the 220 Realty Trust. In June of 1988, he applied for (and subsequently received) permission to legalize the occupancy as five apartments. 431 Beacon remained an apartment house, assessed as a four-to-six family dwelling, in 2017. Francis Gill died in January of 2018. On October 25, 2018, 431 Beacon was purchased from James J, McCarthy, successor trustee of the 220 Realty Trust and personal representative of the estate of Francis J. Gill, by Jodom Realty LLC (John Papadopoulos, manager).